I don’t have a good history with the Barristers Arms. It’s been more than a decade since I last visited, there that I can recall, and it was due to their sarcastic chef. Years ago we decided to visit for some family celebration. I ordered the lamb chops but 12 years ago, when one asked for meal well done, the chef often ignored the request. I implored the waitress to please ask him to cook it well done…I was a fussy teenager then. When my chops were served, they were burnt to a crisp. Not to mention the whole menu was overpriced. I think I was forced to go there again at some point but this was the last time I voluntarily visited the then Barristers Arms. After this incident I never recommended Barristers to anyone and stayed away myself. 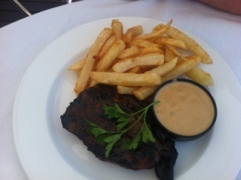 That is until I recently saw Barristers featured in an Eat Out e-newsletter about the best steaks in Cape Town. I was curious as to how this could be, had things changed at long last? I think it was also here that I saw something about a R35 lunch menu, but as I said, I wasn’t rushing back. 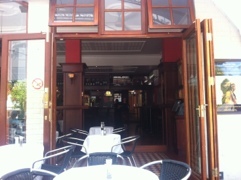 This past Sunday it was 30 degrees in Cape Town and we were looking for somewhere close to home to provide us with a light meal, drink and an outside option. Banana Jam was closed for their Xmas party so I dared to suggest Barristers. A very polite and friendly waitress allowed us to choose our own table on the outside deck and promptly brought us our rock shandies. I asked about the R35 special in which she told us, as long as you ordered before 6pm then you can get your lunch (from a selected pub menu with about 10 options available) for R35. It seemed almost too good to be true! 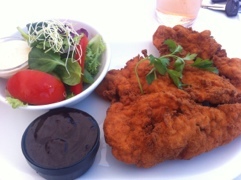 I ordered the chicken schnitzel with Monkey Gland sauce just for the fun of it, I haven’t had that sauce in years! I was allowed a side salad (a permanent alternative to starch) instead of hot chips. It contained micro herbs, normal tomato (yay! I hate cherry tomatoes! ), peppers, lettuce, onions and cucumber with an 1000 island type dressing. My partner ordered the pepper steak which was slightly underdone; the waitress was happy to return it to the kitchen for a few more minutes. 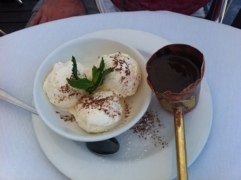 Since lunch was only R35, we enjoyed a Frangelico Dom Pedro and an ice-cream and chocolate sauce dessert. Of course this is how the restaurant makes their money but the value was totally worth it. I will definitely be returning to the “new” Barristers (no longer Arms) for more of these tasty pub lunches (and maybe I’ll even dare to have some dinner at some point) in the near future.